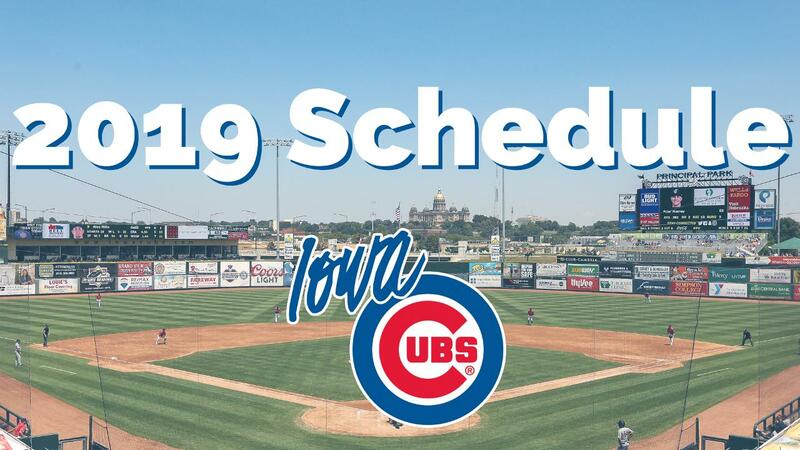 DES MOINES - The Iowa Cubs, in conjunction with the Pacific Coast League, have set their home dates for the 2019 season. Iowa commences its 51st season of play in Nashville on Thursday, April 4 before playing its home opener at Principal Park on Tuesday, April 9 against New Orleans. Click here for the full 2019 schedule. Playing 70 total home games, Iowa is scheduled for 24 day games and 46 night games. The 2019 slate gives fans 11 weekends of Firework Friday, Saturday Pre-Game Catch and Sunday Kids Run the Bases. The PCL bids farewell to the Colorado Springs Sky Sox and welcomes San Antonio to the league for 2019. Iowa will face the newcomers at Principal Park April 29-May 2 and Aug. 19-22. With the addition of a new team, the league will realign its divisions with rival Memphis, a Cardinals affiliate, and Nashville joining Iowa and Omaha in the PCL American Northern Division. Round Rock, Oklahoma City, New Orleans and San Antonio will make up the other half of the American Conference. Iowa's will play two nine-game homestands: May 11-20 vs. Omaha and New Orleans, and June 20-28 against Round Rock and Omaha. Its longest road trip of the season comes May 21-June 2 with a 13-game stretch in Omaha, New Orleans and Round Rock. The I-Cubs will celebrate Mother's Day on May 12, the Fourth of July and Labor Day on Sept. 2 with home games on those dates. Season tickets for 2019 can be purchased by contacting Clayton Grandquist at 515-243-6111 or claytong@iowacubs.com.